If you enjoy a little comfort while camping or in the outdoors, you may be interested in a new portable battery-powered heated blanket that has this week launched via Kickstarter and has already raised over $215,000, with still 45 days to go. 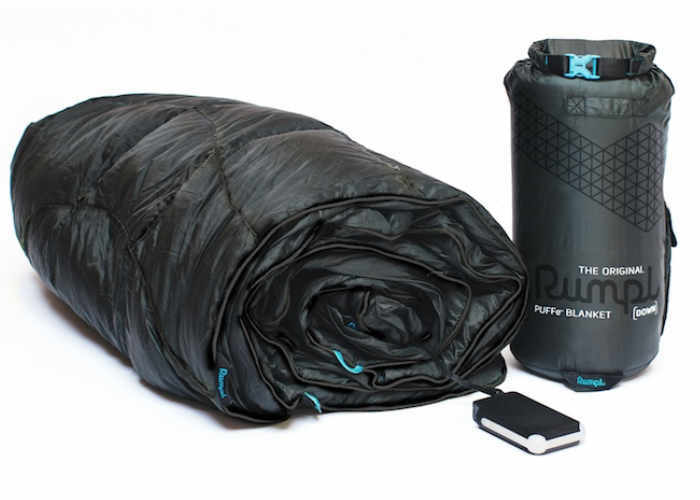 The team at Rumpl required just $20,000 to take their new portable heated blanket into production but thanks to over 890 backers will now be able to take their creation to the next stage of development and start shipping electric blankets to backers during July 2017. The Puffe- is a portable battery-powered heated blanket. It warms you in seconds and can charge your mobile devices. It is durable, water resistant, machine washable, and extremely lightweight. It is the smartest, most travel-ready heated blanket ever designed. It’s available in two versions: Sustainably sourced Natural Down fill and Synthetic fill. Both types pack down and fit in a small stuff sack for easy transport. There are two fill options to choose from: Sustainably sourced Natural Down fill and Synthetic Fill. Both options are highly packable, ultralight, and rated to 45 degrees without the heating element turned on. The Puffe- warms up in seconds using the Ravean carbon heating system. This revolutionary system is insanely durable and literally cannot lose conductivity unless it’s cut by a machete. Additionally, the system is exceptionally safe because it’s not made of metal so you’ll never come in contact with hot wires. All wiring is buried between two ‘sandwiched’ baffle constructions rendering the heating system completely unnoticeable. There are 3 different heat settings, which allow the temperature rating of the Puffe- to be improved by up to 30 degrees. For more information on the new Rumpl Puffe- Battery Powered Heated Blanket jump over to the Kickstarter website for details by following the link below.